The old Nikon 1 V1 of the one-inch sensor series that Nikon called just the „1“ was likely one of the strangest newcomers for the Nikon camera system for a while when it surfaced in 2011. The camera had/s the leading AF performance for the small sensor compact type of cameras. It also shoots raw in very fast series although unfortunately not for long as the buffer fills up just very quickly. AND: the V1 is available for under 300€ right now (May 2014) and this is a reasonable price to get into this system. But likely the best: it can use every F-mount lens build in the last decades. The 1 systems has been underspecified by Nikon in order to avoid any overlap with the Nikon DSLR lineup (some believe). It has so many nice features that it makes me always scratch my head when I find out that I cannot use these features the way I would like to as the interface is just crippled at exactly that aspect. Thinking of the missing cable release for the 1, missing connectors for cable releases, missing buffer for the 4K film crowd, missing manual setup possibilities of the 30/60fps modi etc. Its just so stupid because SOME OF IT is a firmware thing. The camera is just not meant to be used by serious pros – but than why did Nikon build a camera for soccer moms and put some pro specs and a price (when it was released) on it that no-one was willing to pay (for)? One very interesting aspect of the Nikon V1 is the strong crop factor with FX lenses in combination with high speed full res RAW shooting. The V1 shoots 30 fps for a buffer time of one second or 30fps in 0.5 second (this equals 60fps but it only last for 0,5 seconds). As the camera stores these shots as NEF (RAW) files in 10MP resolution it is usable as 4K footage. From 4K you can easily stabilize the film in post processing and you can get to comparable steady 1080p footage. The V1 has a 2,7x crop factor with FX lenses using the FT1 adapter – together with a quick AF system a 70-200 lens becomes a 200-500 f2.8 mm lens! So practically this would be a nice setup for slomo footage of sailing action scenes. There are however some restrictions: the high speed modi cannot be used with a remote trigger (why?) and these modi do not work with anything else than in P-Modus. So you are flying with autopilot in a way. Even more a problem you are also flying in Auto-ISO mode. Than there is this buffer-issue. You might argue that 1 second with 30fps is enough, but I think it is not. To move the level a wee bit higher on the market and to put competing manufactures under stress we would need a buffer of at least 3 seconds. 4K footage is the next quality level that all DSLR manufacturer have to deal with and being first would clearly open up access to a new user community for Nikon. The amount of memory shouldnt be a problem or too much a cost factor and I would also argue that size isnt a problem. 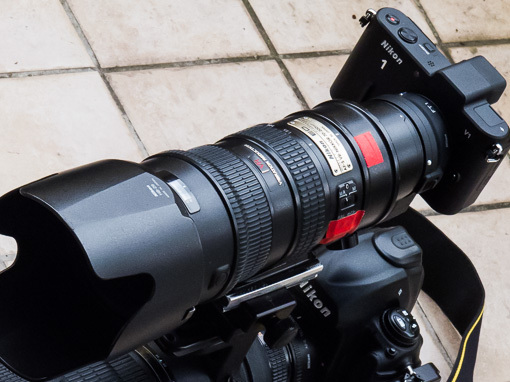 The Nikon 1 is too small imo – its just smaller than is practically useful. And finally the 1 cameras cannot be synced with triggering a DSLR. So either you shoot with your DSLR rig or you look through your 1 systems EVF. You cannot make both systems communicate: focus at the same time pull the trigger at the same time. Shooting high res D800 shallow depths of field RAWs of the action and pushing 120 10MP NEFs onto a card using the 1 system simultaneously? This would be a game changer for all action/sports shooters. Alternatives are right now very expensive (RED camera system with a hardly hand holdable tele setup or a NEX-FS700 kind of system). Other options: the new Sony 7s or a Panasonic Lumix GH4: but again to get to 500 mm tele lens equivalent with quick AFS functionality you will have a hard time to find this setup with these cameras. Than the cost factor: the V1 was really expensive when it hit the market and the only performance where it received an „outstanding“ was AF performance. Not enough allthough AF performance is very high on my list. So summarising the design descisions: too expensive, specs are partly crippled, firmware functionality has been not designed for power users. The Nikon 1 could be clearly a very different beast but Nikon tried to avoid overlap with DSLR performance and doing that it created a strange mixture of capabilities with that device in user-needs-nowhere-land. The recently announced Nikon 1 V3 isnt making much of a change (but HD with 120fps might be cool). Same concept with same basic limitations and even more expensive and with some design decisions nobody can really understand (new battery type, smaller&slower card specs, EVF is add-on, nearly no change in buffer land, same crippled remote driving capabilities as far as I can see from the online handbook, no 4k mod). Why dont they just give us a 4K camera with clever specs and rock the market?! The „1“ System would sell like hot cake and even for the price they ask right now. The HD120fps modus looks promising, but here the proof is in the eating – is it sharp enough? is it working without stabilization? on a boat? So here are some preliminary results from first test drives with the V1. I used the Sessan-Cup (an international regatta race) as a test race to create some footage from the 30fps modus. The slomos looked acceptable within the saturday beamer show but when you have a wee bit more time to check the footage you clearly can identify some problems. 30fps is basically not enough “fps“ to slow down water movements. To receive smooth water slomos faster than 60fps is a must and this shows – interpolation just cannot replace 60-120 fps here. Same applies to boat rig structures. Look at the water movements and at the rig supporting shrouds in seconds 00:19 and 00:22 – interpolation clearly fails to create smooth transitions here and Twixter – (a special frame interpolation software plug-in for AE and supposed to be one of the better solutions for frame rate conversions) isn’t really any better in that respect from what I can tell with initial testing using a demo version. As Tom Hogan put it recently in his article “The Cost of 4K“: going 4K and beeing an “early adopter is costly”. And it clearly isn’t always needed but when you have to stabilize the footage in post processing than capturing action in 4K is actually like shooting in 1080p because in the end this is what remains after stabilization. This is also the reason why I do not believe that HD120fps is a solution. This remains to be tested however especially when the V3 descents from its current price point. Than I will definitly give it a try.